The French presence in Toronto dates back to the origins of the city itself. Étienne Brûlé, a French “coureur de bois” was the first explorer to discover portage routes along the Humber and the Don rivers connected to Lake Ontario in 1615. Today, the City of Toronto can be proud of a French-speaking community that reflects the richness and complexity of Francophones internationally. 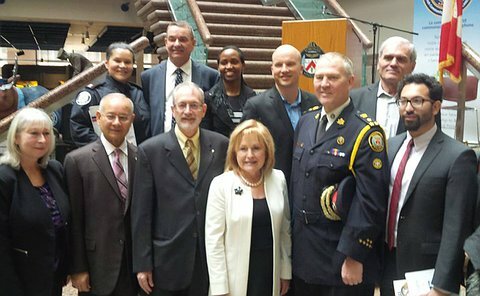 Francophones represent close to 200,000 people in the Greater Toronto Area. The International Francophonie Day was founded by the International Organization of La Francophonie on March 20, 1970. March 20 is now accepted by all French-speaking persons as the day on which to celebrate the diverse Francophone cultures of the world. Every year celebrations occur in our city during the week preceding and including March 20. 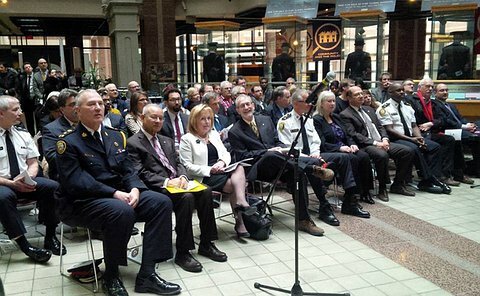 To celebrate and recognize contributions made to the City of Toronto, the Toronto Police Service French Consultative Committee (FCC) hosted its fourth annual International Francophonie Day Celebration in the lobby of Toronto Police Headquarters. 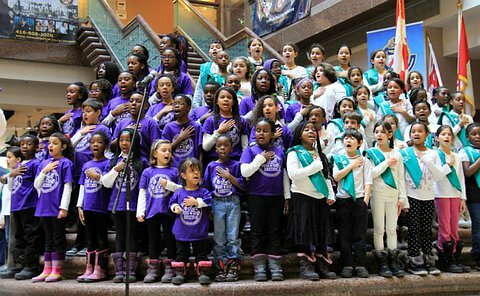 This year’s theme was “Place aux talents – Showcasing Talent,” and this was reflected by the children’s choir who sang Ô Canada and Mon Drapeau. 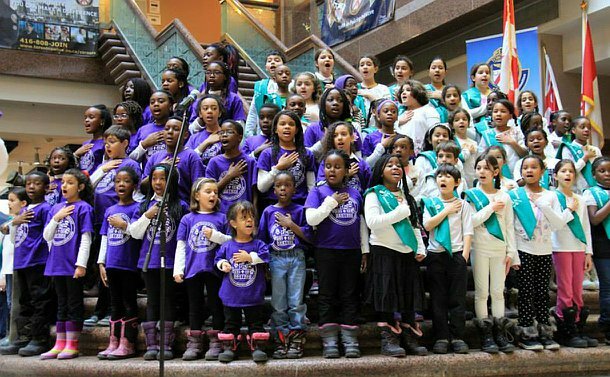 The choir was comprised of students from l’École élémentaire catholique Saint-Jean-de-Lalande and l’École élémentaire Jeanne-Lajoie. 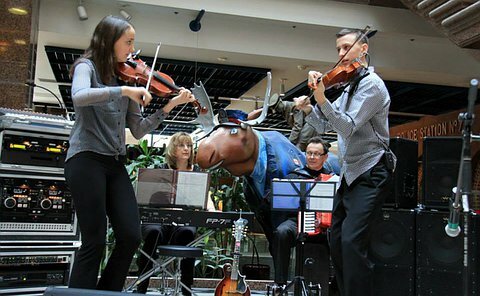 Guests were also treated to the musical talents of Julie Kim, accompanied by Éric St-Laurent, who performed a humorous piece about an interaction with a police officer as well as traditional folklore music by fiddlers Diana and Andrew Dawydchak. Special guests at the celebration included keynote speaker Gérard Lévesque, a lawyer and Francophone rights advocate who stressed the importance for Francophones to be heard as well as understood, and Madeleine Meilleur who was recently named Attorney General, also took part in the event. 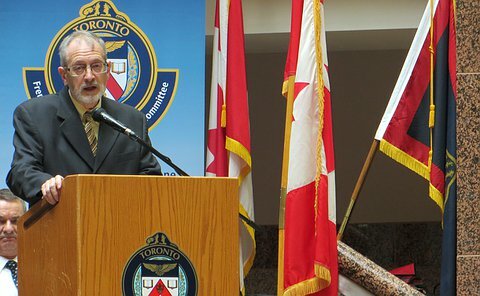 She congratulated Chief William Blair and Dr. Alok Mukherjee, who were present at the celebration, for their leadership with respect to creating strong bonds with the Francophone community of Toronto. The French Consultative Committee is comprised of twelve members from various backgrounds, representing the French-speaking community of Toronto, including co-chairs Director Kristine Kijewski and Gérard Parent, who co-hosted the event with former FCC member Chantal Desloges.